Once upon a time there was a young lad who lived in a small town in Central Ostrobothnia, Finland. The life of this boy was full of imaginative adventures. The shadows of nearby forests were teeming with goblins and trolls, shaped by the rhizomes of fallen trees, mossy stones and the boy’s vivid imagination. With self-made wooden swords and cardboard armors he conquered tree houses with the neighbor kids. Grand battles were played with small plastic toy-soldiers that harshly represented either Americans, Germans, Russians, Japanese or Vietnamese. When the toys reached their psychical limits, paper and pencils stepped in. Those were the tools for harnessing the images storming in the head of the boy. He drew sheet after sheet of mystical and blood-thirsty beasts, fierce dragons and frightening skeleton warriors fighting against noble knights and frenzy barbarians. One day on his way to school the boy’s good friend ran to him and told him about “a magical miniature diorama” in the display window of a local bookstore. The boy had no idea of what his friend was talking about, but with great excitement they hurried to the store. There it was, standing in the middle of nicely arranged school books, novels, art tools and pencils sets – the diorama. A base shaped in hexagon rose up and made a form of steep grassy hill. The top of the hill hosted an old, naked and shriveled tree that stood there like a twisted body. At the foot of the hill three shiny chaotic warriors stood in their black armors waving their gruesome blades in the air as they confronted a great warrior riding on back of a mighty black dragon with murderous fangs in its mouth. The setting had a cold and grim story written in the way that struck hard and deep in that little boy’s mind. He had never felt such an excitement before. He just stared at the magnificent miniature landscape with glazed eyes, his mind blown by the amazing terrain and the violent figures standing on it. All the small details tickled every nerve on his eyes, tunneling in to his very soul. That moment changed the boy forever. I was 10-years-old when I had my first contact with Citadel miniatures. I still remember it like yesterday. The diorama I first saw in the window of that bookstore in my hometown made a very big impact to me, and it still works as a constant reminder of where I began my adventure in the miniature hobby. It was that very same little bookstore where I bought my first set of paints, brushes and a small blister with a set of five miniatures in it, Empire huntsmen or something like that, and started my grand journey. For a long time I spent all of my weekly allowance – which wasn’t very much at the time, so I kind of “borrowed” some from my little sister’s piggy bank (sorry sis!) – for those tiny soldiers. For a kiddo like me it was really challenging to learn how to paint the miniatures. Back then we didn’t have such a luxury like Internet where to search for information for how to paint miniatures or how to use different techniques. There were no White Dwarfs in our town where to read the most recent news in the hobby, at least not that I knew of. Everything was try and error, or trying to mimic the techniques only handful of other hobbyists used when painting miniatures – and they were mainly older boys with little interest in teaching us kids how to paint. I even remember washing my minis with diluted black paint to add shade to colors like skin. Yikes! Ratspike, one of the few books I still get back to every once in a while – for inspiration, nostalgia or trip to the past. There are so many great memories tied to this book. 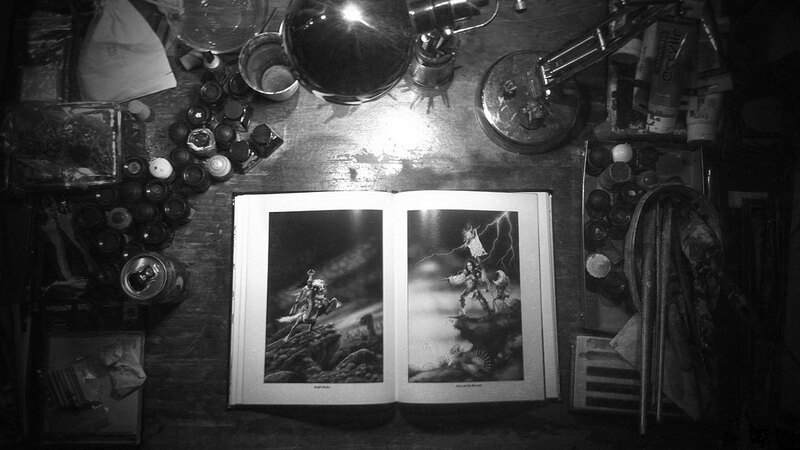 Years passed, Warhammer Fantasy Battle rulebook editions evolved from the 3rd to 5th. Teenage years and computer games came in to my life and, well you know how the story goes. The lack of active hobby surrounding slowly killed the hobby spirit in me and the paints started to get dry in their pots. When I was six I drew and played with model soldiers now I’m 66 I still do in fact I never stopped – thanks for the kind words kari …. A lovely read. I still remember my first miniature. I was 12 years old and it was the very early 80s. I was talked into trying out some game called “Dungeons and Dragons” by a couple of friends at school. Having rolled up an elf (I was in the middle of reading The Lord of the Rings at the time and I fancied being Legolas) I was told I needed a miniature to represent my character. I had no idea what they were talking about, so they marched me down to a shop in town which had a small rack of Citadel Miniatures and I spent 40p of my pocket money on a Wood Elf mini. Thanks MonkeyBallistic! We used to play Rolemaster with Citadel Miniatures to represent combat situations. Fun times! I love reading tales like this. My first introduction to the universe was at a friends place and him converting a set of gorgeous Blood Angels honour guard back at the beginning of third edition. I was hooked immediately and spent hours trying to copy his techniques, and admittedly beating him in painting skill, which has never happened. Never been quite able to recapture the magic of those early days. Anyhow, can’t wait to see some of your miniatures soon! Thank you, looseaxle! I too have similar experiences in my past. My good friend’s big brother was spectacular painter. I remember how we tried to copy the miniatures he had painted, they were so cool. He was very kind to teach us some tricks and how to use different techniques – some of them still in my use. But I think it was the patience that I lacked back then and therefor it felt like I’d never get any better at painting. As obvious as it is, it takes time to make masterpieces. Patience is one of the key essence in becoming a great painter. I often hear younger hobbyists ask me “could you please tell me how you’ve painted that” and my first answer is “with patience”. When you have patience to train, you don’t only get better at painting, but also faster and more versatile. Thanks kraut! So was it your dad who introduced you to this hobby or did you pinpoint him what you wanted (like I used to do all the time)? Hmm, good question, actually: I suppose my dad was never all that interested in miniatures, but he did awaken a love for fantasy and sci-fi in me, I guess. Plus the 80s were a great time for fantasy enthusiasts to grow up in, with all the fantasy cartoons and films (LoTR, Legend, Never Ending Story,…), which I soaked up during my childhood. But my later attempts at getting my dad to join me on the tabletop side of things were mostly without success. We still share a love of well-written fantasy, though. Nice historic stuff… waiting for the part 2! It’s always exciting to get involved into some of the origins of another hobbyist. I look forward to the second installment and to see your incredible talent unfold on Iron Sleet! I feel this is going to be a great precursor to some fantastic miniatures. Excellent quote to open an excellent read.